They are the background of every room; they set the tone for your house; they are the first way that you begin creating your environment-they are your walls. With recent technological advances, fashioning a new mood has never been easier-or more fun. From paint to wallpaper to (yes) leather, today's wall coverings are only limited by your imagination. Decorating with color is fun. It's never a bad idea to let the pros give you a hand in choosing your colors. If you can't find the colors you want, have them custom mixed for you. 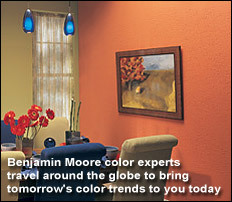 Most all paint retailers have the ability to match any color you take them. 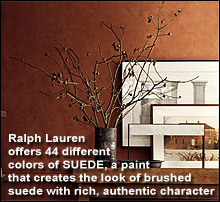 They can match a color in you favorite pillow or a paint chip from and expensive designer brand. Wallpaper is a very common alternative option to paining a room. It provides a very large variety of patterns, colors, and finishes to choose from. The wallpaper can be dramatic, whimsical, comforting, stimulating, formal, casual, and on and on. Wallpaper has the largest selection to allow you to show your personality in any form, be it traditional, transitional, contemporary, or just plain 'off the wall'.